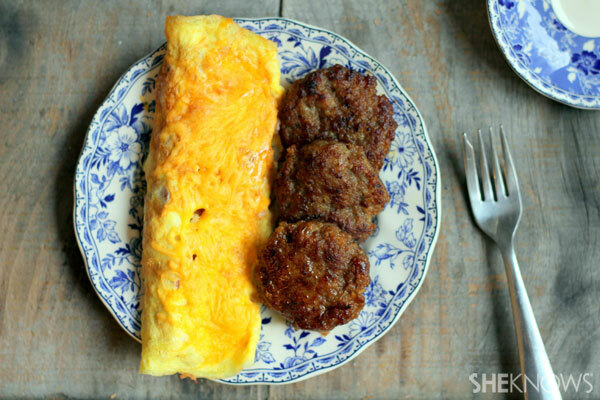 Making a country-style omelet is as easy as making any other omelet. In just a few simple steps, you’ll be saying yum! A country-style omelet has a few basic ingredients: eggs, ham, hash browns, onion and cheddar cheese. The eggs, ham and hash browns will need some preparation. While prepping the ham and hash browns, let the eggs come to room temperature. Use about 3 eggs per omelet. If you have precooked ham, all you need to do is cube it, but if you don’t, you can buy precubed, uncooked pancetta in most deli cases. Saute for a few minutes and it will be ready to go! Hash browns will also need to be precooked before they can go in the omelet. Also grate a few tablespoon of onion. Now that your eggs have reached room temperature, they are ready to be whisked. Try to whisk until your eggs become frothy. This will ensure a light and fluffy consistency. If you want a more dense and creamy texture, add 1 tablespoon of heavy cream while whisking. Low heat is key. If the heat is too high, the edges will brown and crisp before the center of the omelet has begun to cook. Be sure to warm your pan to below medium heat. Mix the ham and grated onion into your egg mixture. Rub the pan down with a bit of butter and pour the egg mixture in. After 4-6 minutes, when the mixture is mostly fluffed and set, scoop the hash browns and cheddar cheese into the middle of your omelet. Many omelets can be folded, but a country-style omelet is best rolled. Try to lift 1/3 of the omelet up and roll it over the middle. Then pick up the middle and roll it onto the left side. At this point, your omelet will be rolled up like a burrito and ready to put on an oven-safe plate. Now that your omelet is cooked and ready, all that’s missing is a topping. Adding a few extra tablespoons of cheddar cheese to the top of the omelet is encouraged. Pop it under the broiler for just a minute to let the cheese melt, and your omelet is done!